3 Full size jars packed with 1 - 3 grams of product. All 3 shades are lip use safe!! Atomic Teal - No doubt: This IS teal. 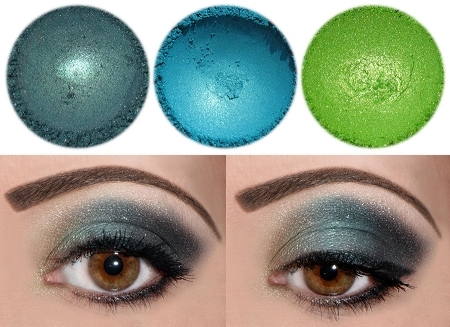 Deep, sparkly teal. Mica, Titanium Oxide, and Iron Oxide. Tickle Me - Very deep and sparkly aqua. Contains - Mica, Titanium Oxide, Iron Oxide and Tin Oxide. Envy - A Spring green with sheen and sparkles. Contains - Mica, Titanium Oxide, Tin Oxide, and Iron Oxide.